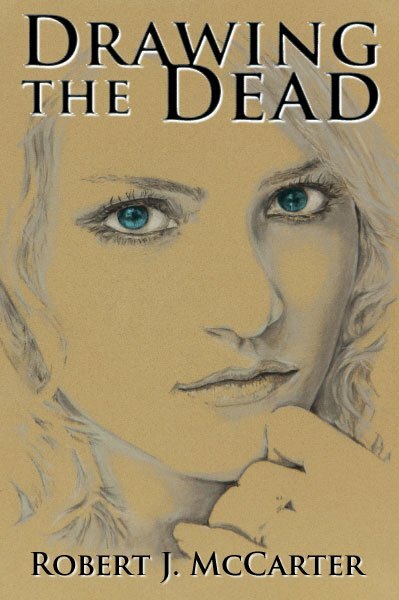 This is the second, and last, part in a series on my novel, Drawing the Dead. You can read the first part here. In the first installment of this series, I talked about the formula for this novel, or really for any novel. Now I will talk about inspiration. Writing a novel is a long process, and as I writer, I find there has to be something in it for me. Beyond just the accomplishment of writing it, I need something that gets me excited and keeps me excited. In the last post, I talked about the dream my wife had (where she drew our dead friend and he came to life on the paper) that inspired this book. That was the starting point, the unique and exciting idea that got me involved. And really if you are going to take the many, many hours it takes to write a novel, there needs to be something interesting and fun to explore. A lady that draws dead people who then come to life and talk to the living, certainly qualifies. The protagonist for this book, Viki Dobos, is an artist. That had its appeal (I do love the arts), but it didn’t give me traction until I found an inspiration for her. When I look at the stories I’ve told, I can pick out certain parts and tell you where they came from. Sometimes (actually often) I steal bits of my own life and experience and use them; sometimes I steal things from friends and family; sometimes I hold someone I love close when I write a character. I’ve never “based” a character on a real person (I actually have no idea how to do that right), but in the case of Viki Dobos I did use a real person as inspiration. My friend VTara Rusher was a wonderful artist, loving mother, and good friend. (Yup, I just referred to her in the past tense… we’ll get to that shortly). Viki Dobos, is an artist and a woman. My need to draw from something real to create my fictional character took me immediately to VTara . Her art has this soft, vibrant fell to it that fit well with what I wanted. VTara had a calm, steady presence, and was very likable, very easy to be around. And, to me, VTara was always creating art. Closet doors turned into a mural of the San Francisco Peaks; a headboard with vibrant colors radiating forth; textured paint on the walls. VTara was always an artist, and that is what I needed for Viki Dobos. Someone who lives and breathes their art. In 2011, when I started writing the book, VTara was in remission. She had been diagnosed with colon cancer in 2008. The old saying is that it takes a village to raise a child, well it takes a village to deal with a disease like cancer. VTara’s journey was part of our lives. My wife’s non-profit, Further Shore, stepped in and helped her along the way. Her step by step progress was a part of all of our lives for those years. So, when I started writing about an artist character, Viki Dobos, I could think of no one but VTara. I saw it as a way to honor her and our friendship, and as a celebration of her returned health. In 2011, during the book signing for Shuffled Off, I told her what I was up to, and that I wanted her to read the book. She was gracious and encouraging. Unfortunately VTara’s health took a turn for the worse after that. The third reoccurrence happened in early 2012, and in April 2012 she went into hospice. My feelings around this were complex. I was sad, of course, but I felt this sense of urgency. I really wanted VTara to read the book. I had no idea if she would like it, but I wanted to let her know that she inspired me, that I loved her. And this book, with her being an inspiration for parts of it, seemed like a way to make tangible how I felt about her. I won’t speak much about hospice here, but often times, at the end like that, people are very particular about what they want to do with their time (not surprisingly). Luckly, VTara still wanted to read the book. At the time I was working on revisions, getting it ready to send out to my beta readers. So I double timed it and got the manuscript to her. Normally, the first time a story leaves my head is when I read it to my wife. This is an important part of my process. I read it aloud (and find lots of mistakes I wouldn’t otherwise) to her. In many ways, Aleia is my prime audience. I want to write things that move her. But, in this case, VTara came first. While I was reading it aloud to Aleia, VTara was reading it on her own. Fittingly, she was the first one (besides me) to finish the story. I got to sit with VTara for a while during her hospice time, a week or so before she passed. Aleia and I went over. I remember VTara sitting on her couch and Aleia and I in chairs across from her. She was quiet, very internal, and peaceful. We talked quietly of many things. I wanted to asked her about the book, but I didn’t bring it up, letting VTara lead. We did end up talking about it for a few minutes. She told me that she loved it. I remember her telling me how she liked how much time was spent on the beach (much of the book takes place on Maui). She said that boundary between earth and sea represented well the emotional journey that characters were on. It was a very VTara comment. I asked her what she thought of the “art” in the book and she said that I had done good. I miss VTara. I miss her calm, loving presence. I am sad that she won’t be creating any new art (at least not that I can see). But, I am grateful that she got to be a part of this piece of art. I am grateful for her friendship. We feel her absence, and our community dearly misses her. Not surprisingly, the book is dedicated to her. So if you knew her and you are reading about Viki Dobos, realize that Viki is not VTara, but that artistic sensibility, that intuitive nature, that gentle presence is inspired by VTara. I love Hawaii. Specifically the island of Maui and the town of Kihei. I LOVE IT. Warm weather, beautiful beaches, great snorkeling right off the beach, dry, sunny weather. What’s not to love, right? I started Drawing the Dead in early 2011. I got the first 10,000 words done (about 40 pages), and then things fizzled. I had already placed much of it on Maui in and around Kihei (my wife and I have been there several times), but things just were not clicking. I wasn’t sure if the story was right. So then in June of 2011 we spent a glorious week on Maui. Since the book was in progress I was thinking about it and we scouted for locations. One day we took a long walk down the beach from our condo at the Hale Pau Hana in Kihei down to the Grand Wailea in Wailea. I knew I needed a high-end house on the beach so I took my camera and we went scouting for it. I ended up finding the perfect house and snapped some pictures. I also was at a restaurant the characters go to, the beaches they walk, and went on a trip up the volcano to Haleakala National Park, they go on. All scouted live and in person. So when we got back, I read my wife those 10,000 words. She loved the start of the story, and that combined with the vividness of our recent journey to these locations and the words just flowed. I was inspired. One of my beta readers is familiar with the area and he told me the locations felt real. And they do, because they are. When I wrote Shuffled Off, I got very attached to the characters. They are real to me. I know their words come out of my brain through my fingers, but they feel like separate people. People I like, people I want to spend more time with. So, back when I was first contemplating Drawing the Dead, I was finishing up Shuffled Off. I realized that since Viki Dobos drew the dead, I could involve JJ, Jesus, and Banquo (they are ghosts, after all). I liked how the story was shaping up in my mind, but brining in JJ and the gang for a cameo gave me the boost I needed to commit to the project. I also got to do some fun things. Since Drawing the Dead and Shuffled Off share the same fictional universe (which they have to if JJ and company were going to show up), that let me do a lot of creative things. For instance the book Shuffled Off exists in Drawing the Dead, it provides a key piece of information. And since a sequel to Shuffled Off is coming (it’s called To Be a Fool) I could give tiny clues to it in Drawing the Dead. And lastly, there is an oblique reference to yours truly at the end of the book (look for it, it made one of my beta readers laugh out loud). Lots of inspiration went into this book: the premise (drawing the dead), my friend VTara, the location, and bringing in old friends. It made all the difference. Interested in reading it? You can read the first few chapters right now. Now In Print – Meteor Attack!